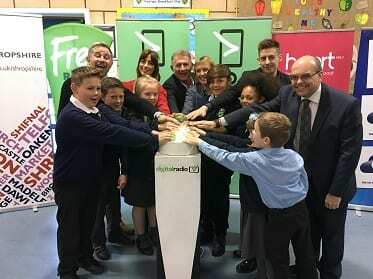 The launch of new digital transmitters that have transformed the availability of local radio services on DAB digital radio for listeners throughout Wolverhampton & Shropshire was celebrated at a special ‘switch on’ event at Newdale Primary School in Telford this morning. Local presenters Ian Perry, who presents early mornings on BBC Radio Shropshire, and Ed Nell, home run presenter on Free Radio, pressed the big green digital radio switch at 08.45am to signify the expansion of local DAB coverage in Telford and across Wolverhampton & Shropshire in front of pupils and staff from Newdale Primary School. The expansion of coverage means that many listeners can now receive eight further radio stations - BBC Radio Shropshire, BBC Radio West Midlands, Free Radio, Free Radio 80s, Heart West Midlands, Smooth West Midlands, Radio XL and Capital - on DAB digital radio for the first time. The new transmitters have transformed DAB digital radio coverage throughout Wolverhampton & Shropshire. Four new transmitters have launched in the past 18 months and a final transmitter will launch in Market Drayton in the coming weeks. The five transmitters bring the county’s popular local stations to 650,000 more listeners on DAB digital radio in Wolverhampton & Shropshire and have expanded local DAB coverage to 92% of households from 53%. Although DAB digital radios are in over 63% of homes in Wolverhampton & Shropshire and almost 90% of new cars, many listeners in the area were unable to receive their favourite local stations on DAB digital radio before the new transmitters, which have been built by communications infrastructure company Arqiva, launched. Wolverhampton & Shropshire’s five new digital transmitters are part a programme of work co-funded by Government, BBC and commercial multiplex operators to expand coverage of local DAB stations from 75% to 90% of UK households, in line with FM coverage for commercial radio. Over 200 local DAB transmitters have been built nationwide and the local DAB expansion programme is largely complete with the last remaining few transmitters to launch by the summer. In total, an additional 10 million adults and over 4,000 miles of the UK road network have been brought into coverage for local DAB stations. Listeners in Wolverhampton & Shropshire are encouraged to retune their digital radios to ensure they receive all their available stations, including the county’s local stations, on DAB.